Ah, I guess Sea Foam Moss hasn't made it to the modelling world downunder yet. It is not actually a moss, but a small shrub. 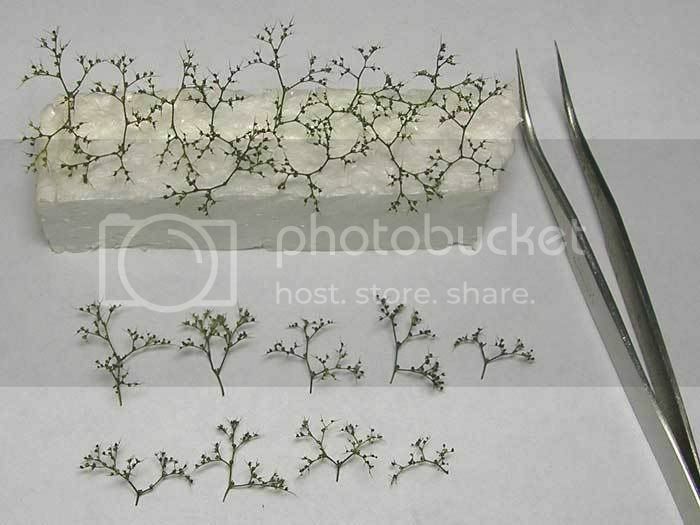 The usable bits are the flower heads and they are left to dry after flowering is finished. To give it it's proper name Teloxys Aristata. Seems I was wrong though, not from the Arctic, but the Gobi desert, nearly as cold and inhospitable It is possible to buy seeds to grow it ( Sea Foam ) which I did think about trying, but being cheap, I'm going to try with the seeds from the bits I have Not sure yet if they will work, but worth a try, not that I need any more at the moment. Last edited by Steve Bennett on Sun Apr 05, 2009 11:15 pm, edited 1 time in total. Ah, I guess Sea Foam Moss hasn't made it to the modelling world downunder yet. Hi, although work, family and house DIY have completely stopped any modelling from me for the last few months I still keep an eye on "Simplicity Sidings as my version is the only layout I have! 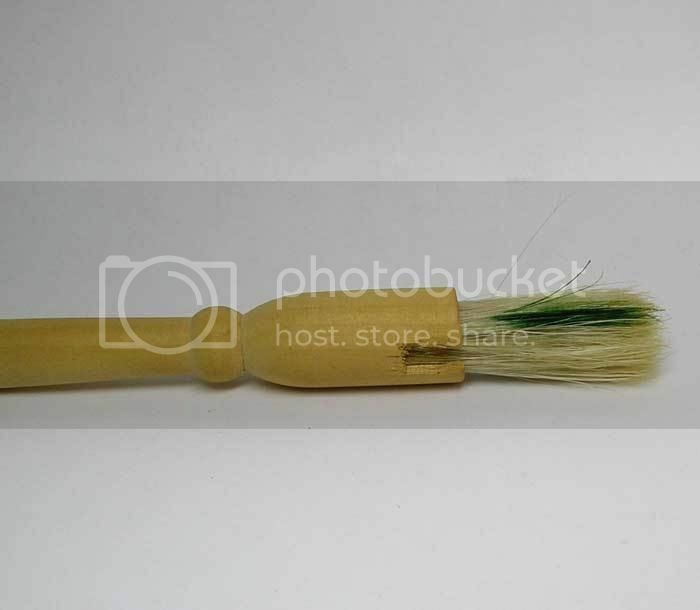 I just love the detail and variation - in Per's case he used brush bristles for the longer grass stems and he used woodland scenics material + and I think this is where his work scores , he also airbrushed a lot of different shades on to the materials after he applied them. Damn, thats this evening taken care of, will have to search this out, I really like his work. Gives great step by step guides on how he does things too . Hopefully you will find some time to get yours finished Gordon, if I remember rightly, you had some more details to add to it from your holiday, hint . Thats good to hear, it really is a useful material. I had a go at staining some last night, using the same mix as the grass seeds above and it worked fine. Not a great photo, the white background makes it look a bit darker than it really is. Maybe I will plant some on a layout and try another pic later. Thanks for the hint Steve - that list is probably buried under several other "to do lists"
Gordon thanks for the link, I think that I will just crawl back into my corner and give up modelling for a while. Sorry about that Steve I meant to say how much I have been enjoying your step by steps on this project. Every day I realize how much I don't know and how much there is to learn. michael wrote: Sorry about that Steve I meant to say how much I have been enjoying your step by steps on this project. Every day I realize how much I don't know and how much there is to learn. No problem and no apology needed I'm amazed the number of views this thread has generated, it is only just over half a square foot of real estate after all . It is a fantastic piece and the photo's in particular are well worth studying very closely. Have liked his work for quite some time, but this must be his best yet, superb. Don't get too hung up on the airbrushing, there isn't much there really and he probably could have used other methods to get the same results. The airbrush looks to have been used early on to get the algae and slime in the puddles and on some of the wood. Then at the end, I think he has used a bit of yellow to bring out highlights. It really is a great lesson in building up the vegetation in multiple layers, mind you, he has invested a lot in scenic materials as well. Returning very briefly to the stained Sea Foam shown above, maybe the camera wasn't struggling quite as much as I thought, it had come out darker than expected, will have to use a lighter stain next time . Steve Bennett wrote: Funny, you should highlight the brush bristles as for long grasses, this is the one area that i think he might have done a little better, by having a few more bristles, maybe five or so at a spot, rather than one or two . Think I could have worded that a little better It is a fantastic piece. and yet others have greatness thrust upon them..."
'til Aust Narrow Gauge Convention 2009..."
When you stop learning in this hobby, then is the time to give up . Don't get too hung up on the airbrushing, there isn't much there really and he probably could have used other methods to get the same results. Don't ruin my excuse Steve - I treated myself to a new Iwata airbrush and a decent compressor couple of months ago - and with a few hours a week practising think I have got the hang of it now. gfadvance wrote: Don't ruin my excuse Steve - I treated myself to a new Iwata airbrush and a decent compressor couple of months ago - and with a few hours a week practising think I have got the hang of it now. That's good to hear, a wonderful tool to be able to use. Opens up lots of new areas, if you are going to try the salt weathering techniques, pretty much essential. Steve, bad joint on the fence post ? given the apparent age of the wood and its surroundings it looks just right to us. Pandy wrote: Steve, bad joint on the fence post ? given the apparent age of the wood and its surroundings it looks just right to us. Here I was idly looking at my Bookmark Bar and decided to click on Gn15. Big mistake . Almost enough to get me back into the 4D world . That is awesome stuff that Norwegian produces. Must be those long dark winter nights. Glad to see your name popping up again Steve. 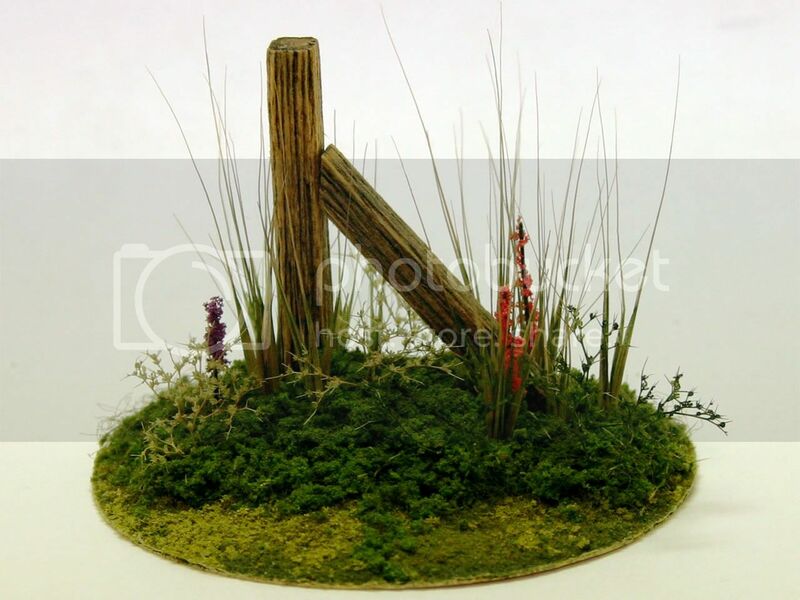 The finishing touches can make or break a layout, even something this small needs a few details to draw the eye in. I guess I could have just pointed everyone to my site for detail parts but thats not what this thread was all about, so I tried to think of something cheap and cheerful that could be found just about anywhere. After a lot of thought, I think this should be pretty universal, though only a suggestion. WARNING : PLEASE ENSURE ANY LIGHTER YOU TAKE APART HAS NO GAS LEFT IN IT AND IT IS BEST TO DO THIS IN A WELL VENTILATED AREA, OR OUTSIDE. Hope that sinks in . To take one apart is fairly easy, a thin bladed screwdriver and if you really want to get into it, a pair of side cutters or hobby saw will help. The first step is to prise off the metal flame guard from the top, once that is removed, it is easy to extract the rest of the workings. Laid out below, you will see all the parts extracted from 2 lighters, it's amazing what there is in these things. The one on the left an electric one, the one on the right, the old flint operated type. Both supply some of the same bits, some are unique to the type. 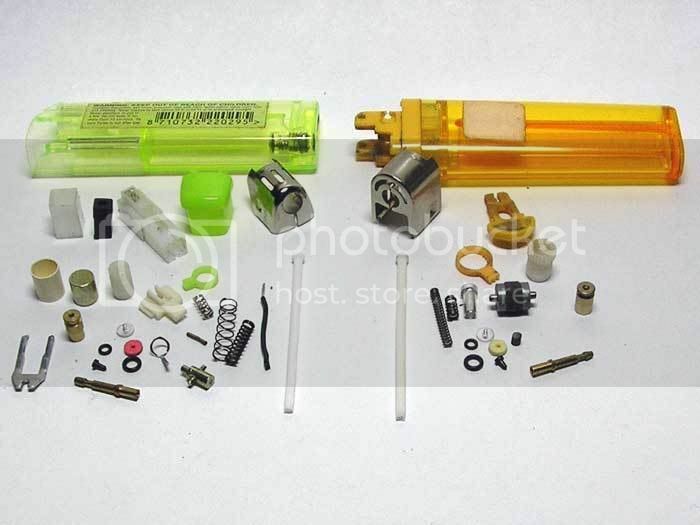 OK, you may be saying, but what to do with all these bits , here are a few suggestions. Firsty the cardboard boxes, which I admit, are not really suitable for outside in anything but the driest climate, so possibly better for in a workshop or similar. For outside, a wooden or metal box would have been better. 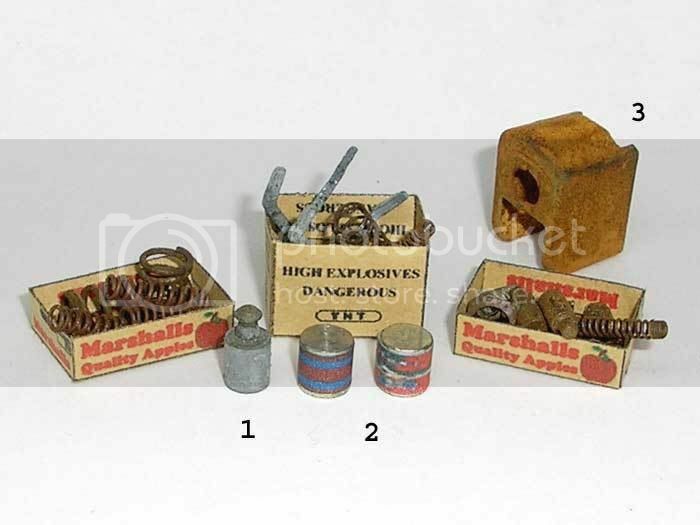 The contents of the boxes are all from the lighters (4 of them) and could be used as they are, but to give a bit more character, I rusted them by dropping them in the rusting agent from a two part rust paint, for about 30 seconds, more on these paints later. A few items I picked out for further mention. #1. This is the valve from the top of the flint operated lighters and looks pretty good as a bottle or can on a shelf, or even on the footplate of a loco. #2. 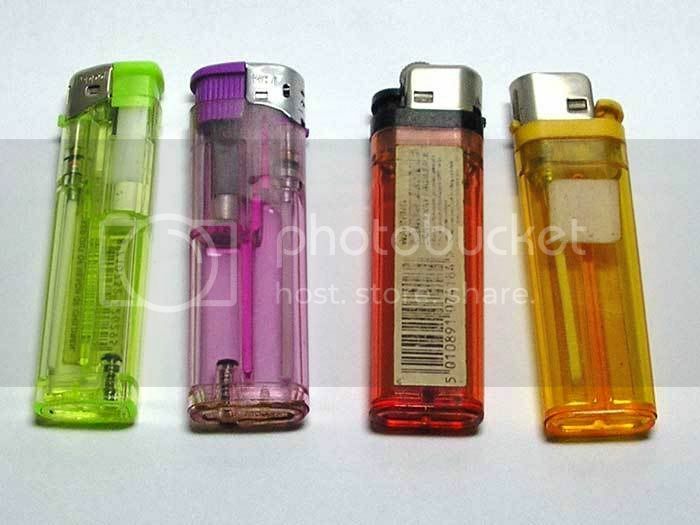 These are the batteries from the electric type lighters. The labels were simply created on the computer and printed onto sticky labels then applied to the sides. The one on the left is just coloured lines, the one on the right is from a sardine tin label found on the web, though you would never know at this size . #3. This is the metal flame guard from the top of the lighter, suitably rusted to be lying around in the yard, more on this next and I will start with a pic to show a few variations. After, I will explain how the finishes were done. #2. A different part this time, this is the bit you push down with your thumb to ignite the electric type lighter. First it was painted with a dilute white glue, then while still wet, iron powder was sprinkled on and set aside to dry. Once dry, white vinegar was brushed over it and the rusting process started. Though this process gives quite a uniform finish, it can be given washes of rusty colour paints after to enhance it further. #4. The same two part rust treatment as #3, but I thought I would stick in some weeds left over from earlier to show how it could be incorporated as a neglected piece rotting away in a corner somewhere. #5. This again uses the two part rust treatment, then once dry, a wash of Burnt Sienna poster paint applied to give a bit more depth. OK, thats as far as I'm going with the lighter bits, the plan here was just to trigger a few ideas of how everyday items can provide bits to use. 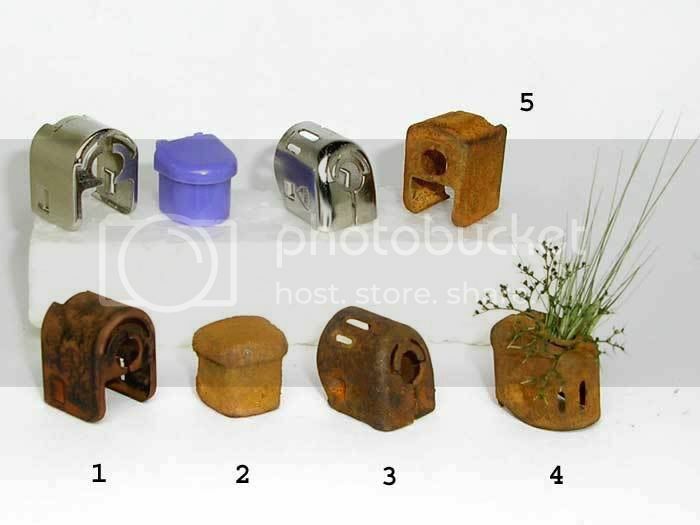 It is surprising what a bit of rust can do . 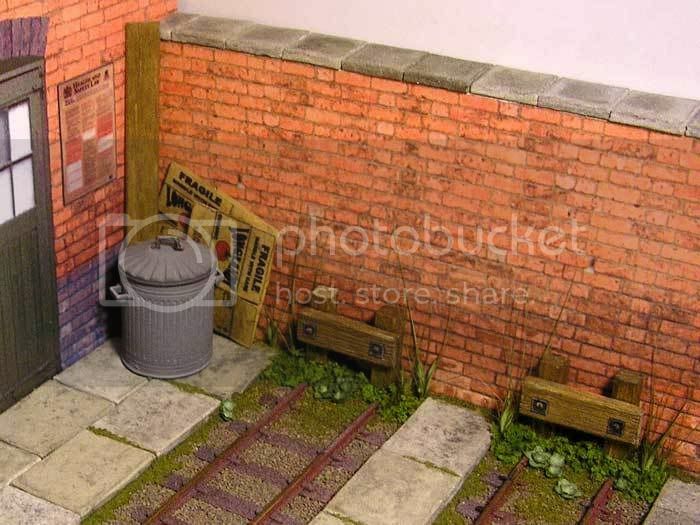 Here are the boxes of bits on the layout and if you look carefully, you will see other bits lurking in the weeds. 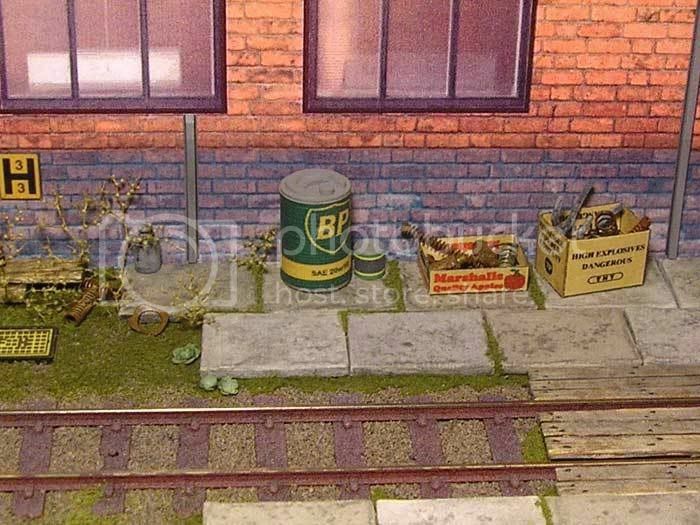 To finish this section, one final pic of my favourite corner of the diorama. Again, fairly restrained detailing and at last one of my commercial items to maybe tempt you . The simple elements here are enough to give the corner a bit of interest to draw the eye in, the plank of wood is there to cover the join between the two walls, along with the folded boxes, which really give this corner a lift. Well, I guess that is about it, until I think of something else to add . I hope this thread has been interesting and maybe taught a few tricks along the way. I have certainly enjoyed it and am looking forward to building a second board to join onto it. Oh, nearly forgot. Right back at the beginning, I said that once finished, I would weigh it . I can now reveal that the finished weight is (drum roll please) a massive 0.6kg or 1 pound 2 ounces in old money. OK, I'm off to play . Last edited by Steve Bennett on Sat Apr 18, 2009 8:41 am, edited 1 time in total.